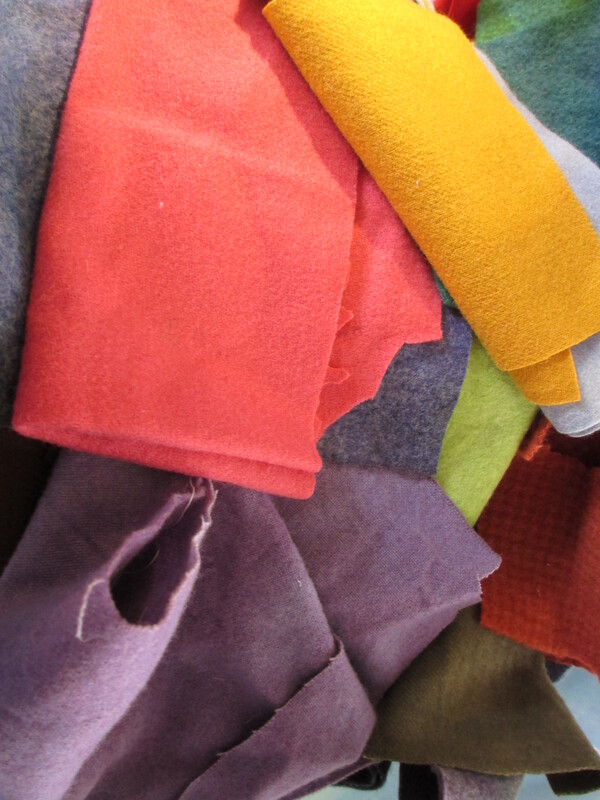 and have quite a collection of felts – some hand dyed wool felt, some quite thick, some thinner and some more like wool suitings. 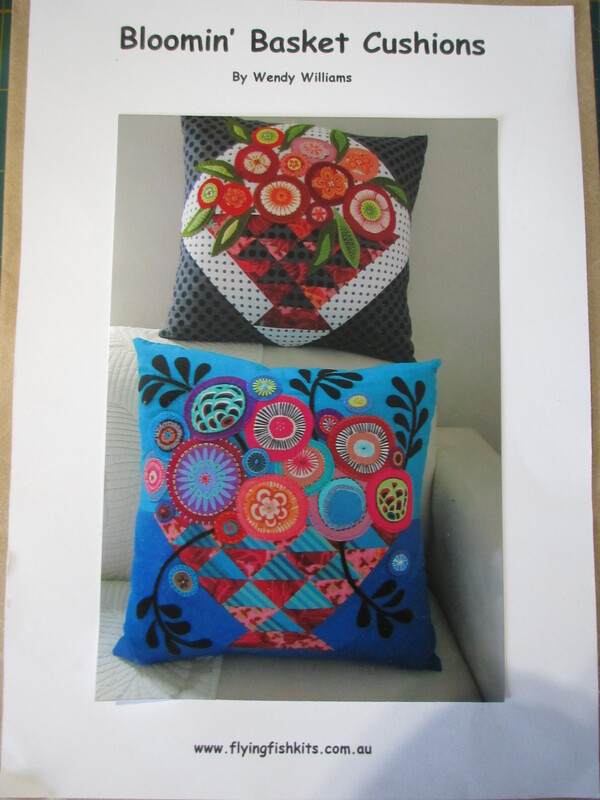 This year I didn’t attend the Australian Quilt Convention in Melbourne, but a friend did – and she had booked into a workshop with Wendy Williams to make a cushion. 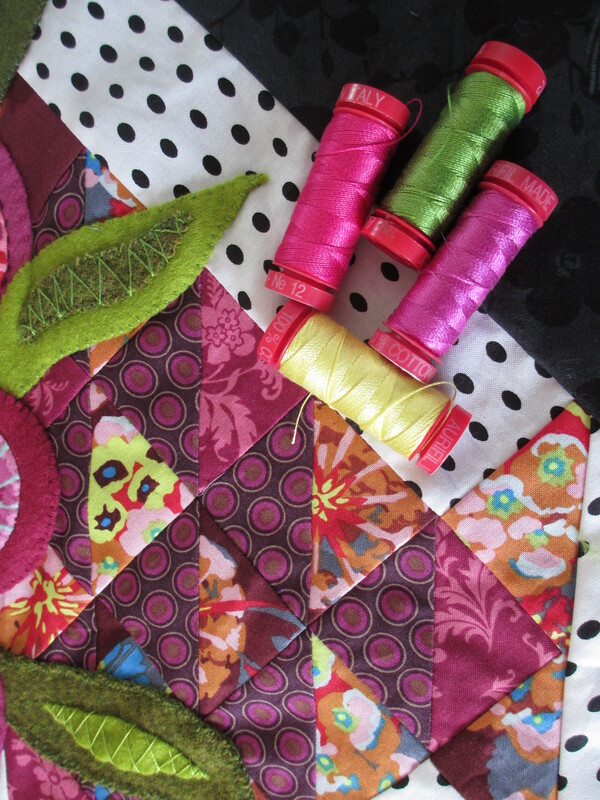 I had a while ago purchased one Wendy’s colourful cushion patterns, so I decided to start stitching it (is that called living vicariously through a workshop?!!). Of course, I didn’t choose colours that went with my decor – I wanted to try some new colours and began selecting the basket colours first and using similar backgrounds (black and white) to the original pattern photo. 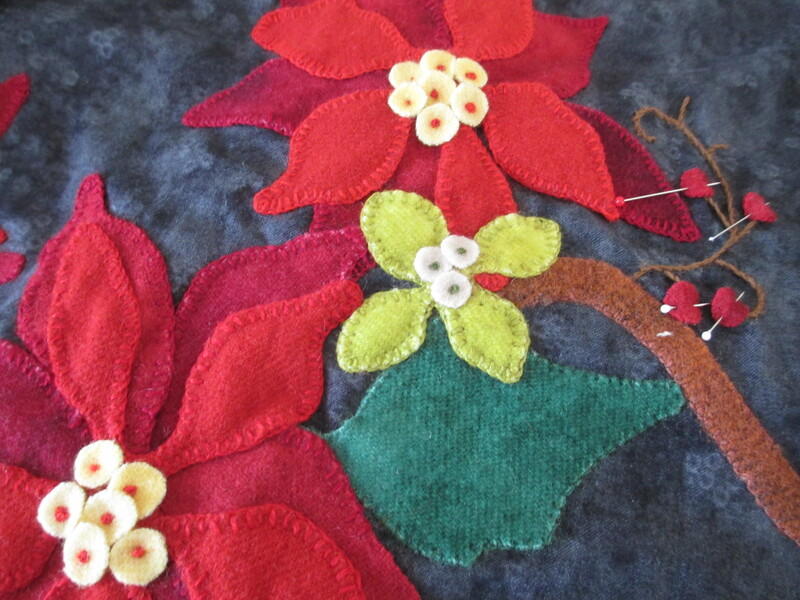 Then the fun starts – choosing all the gorgeous felted wools to go into the flowers and leaves. I had quite a few at home to choose from, and did buy one or two to add to my felt stash. I used Wendy’s idea of putting fussy cut floral fabrics or graphic patterns as the centres of the flowers (a good way of making ‘cheddar cheese’ out of fabric!). Having a selection of Ne 12’s and Lana threads to choose from was great – however I found I wanted to purchase some more as I didn’t quite have the ‘right’ colour at times. (a good way of extending my thread collection!). 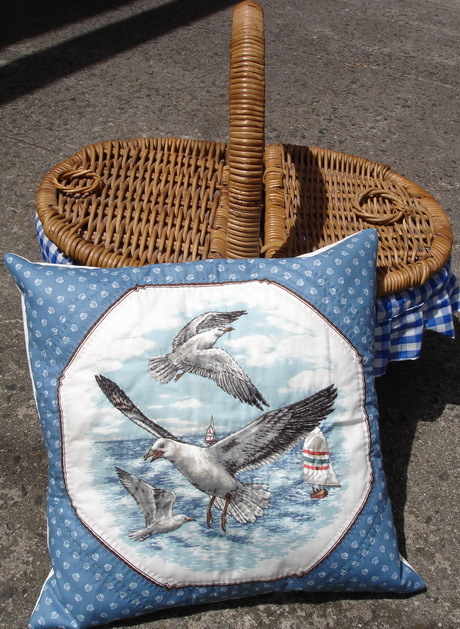 I don’t think you can have just one new cushion – so I am going to make another one, using similar colours (another chance to buy some more fabrics??). 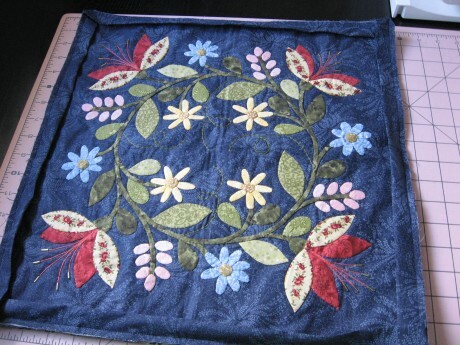 I haven’t got to the quilting stage – but I may hand quilt it in Ne 12 – or – on second thoughts, I may machine quilt it in Ne 28 or 40 to ‘puff’ up the flowers and leaves. The possibilities are endless!! 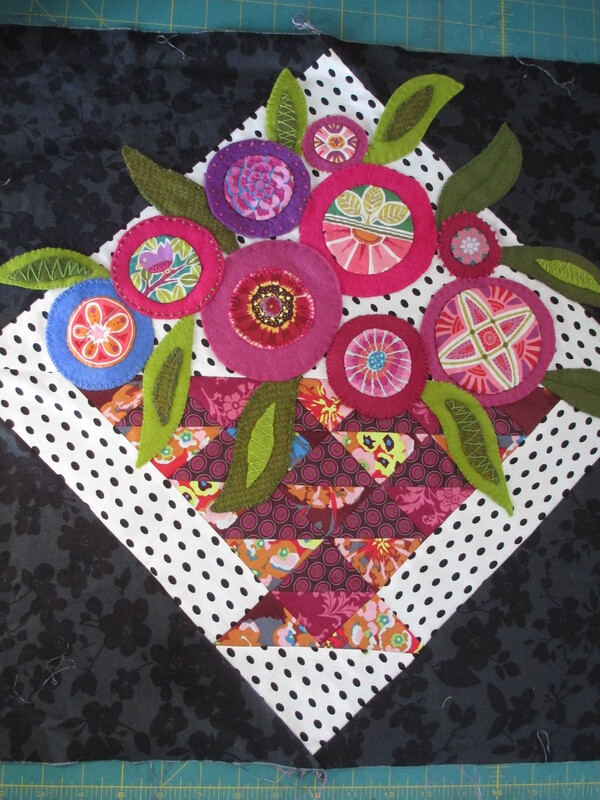 I just have to complete the quilting, make a cushion backing, buy an insert and I’m finished! 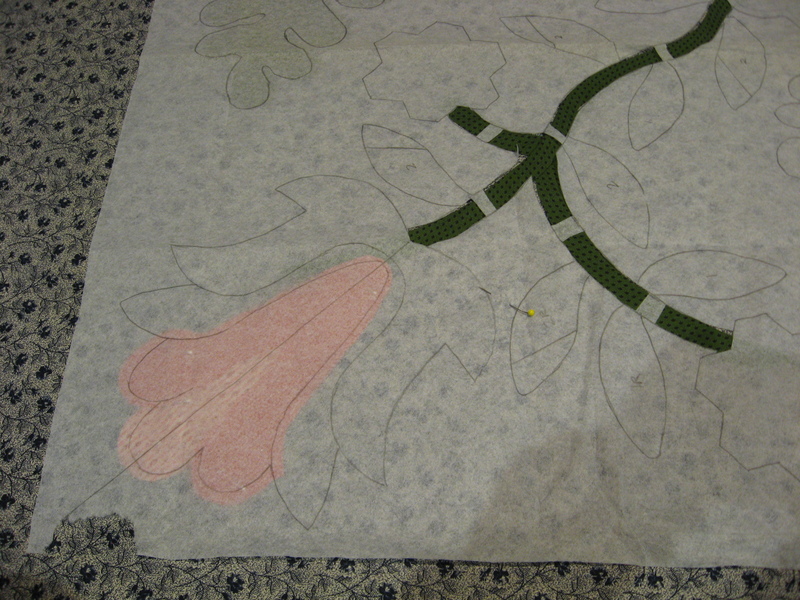 Unfortunately I don’t have a photo of the applique in process, but here is a close up of part of the cushion, showing details of the applique, embroidery and bugle beading on the ends of the stamen. 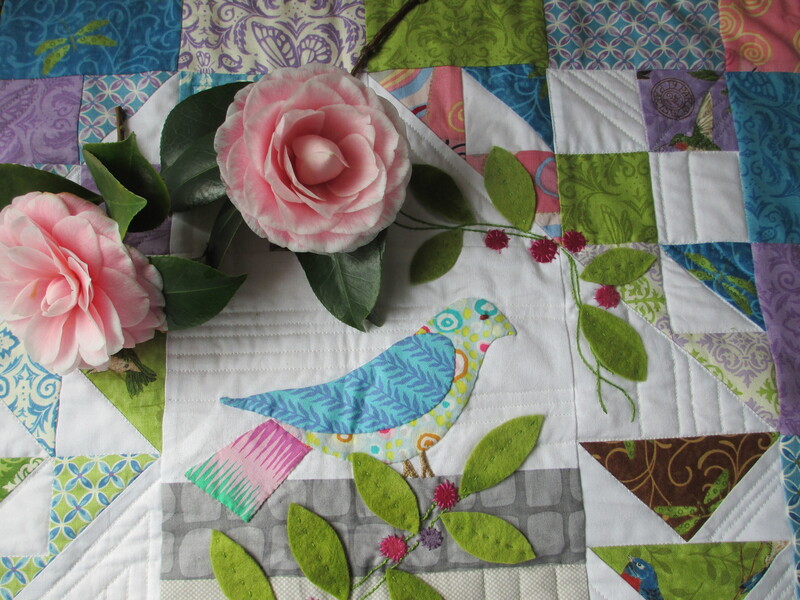 I used Aurifil Cotton Mako Ne 50 for the applique, Ne 40 for the machine piecing, and Ne 12 for the embroidery, and have on hand Ne 28 should I decide to add quilting. 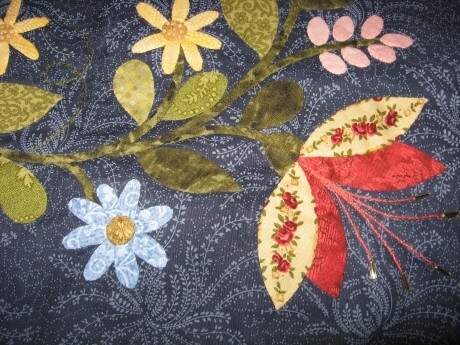 Close up detail of applique. 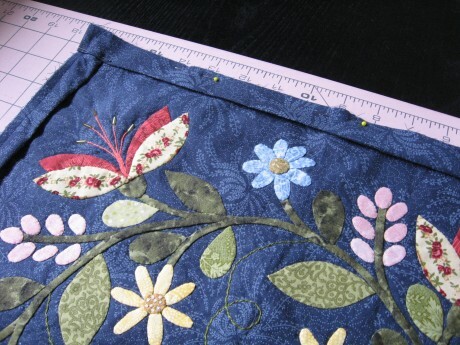 To ensure a neat and firm closure I inserted a zip in the middle of the cushion back. 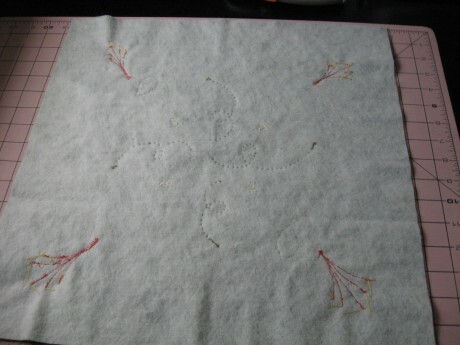 You can also make a button closure, use press-studs or Velcro, or simply have a large enough overlap with the back pieces, so that the opening doesn’t gape. However, if you like to have a full type of filling (a fat cushion as opposed to the skinny variety), I have found that a zip works well. 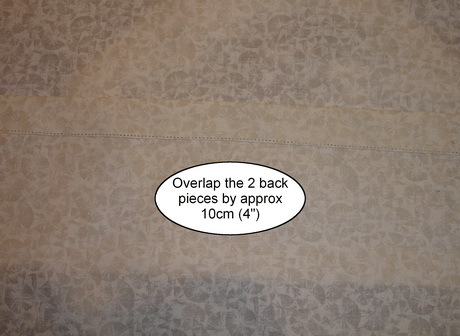 Don’t be tempted to make the opening too small, as this makes it difficult to fit in the cushion insert. 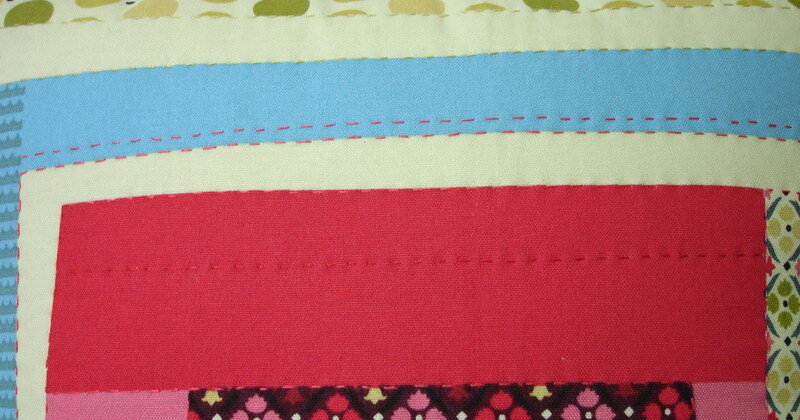 To finish the edges of my cushion, I used a binding, just as I would bind the edges of a quilt. I have used this method before and found that it works well. I used a double fold binding which I cut 2 inches wide, which resulted in a neat narrow finish. 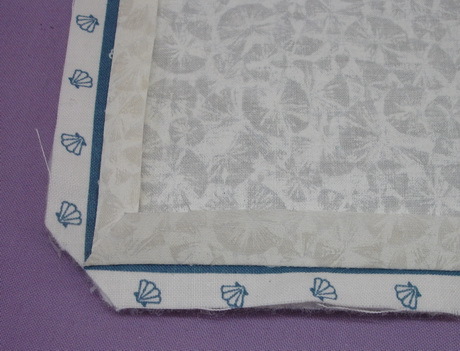 The binding is machined to the cushion front with the corners mitred in the usual manner. 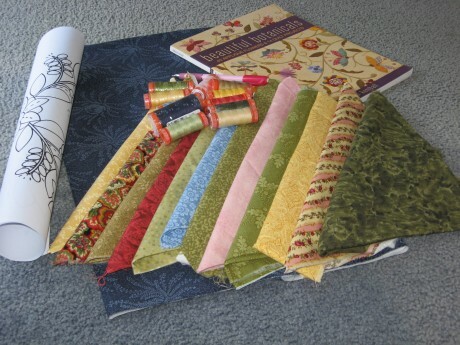 Then the binding is folded to the back and stitched down by hand. 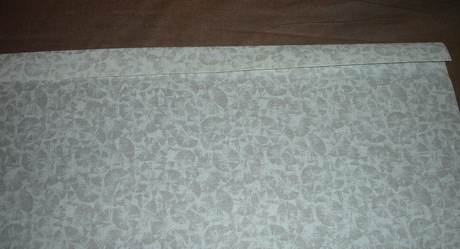 The binding machined to the cushion front. 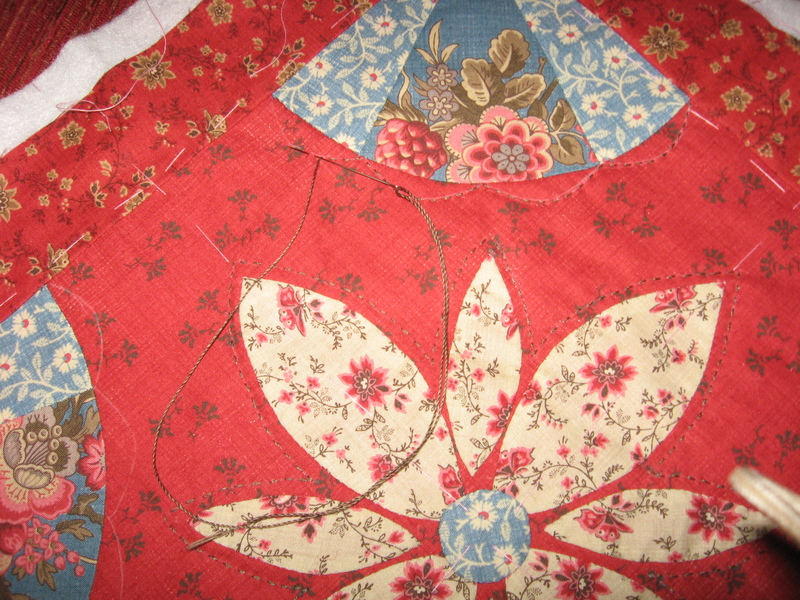 Since I used some embroidery in the cushion construction (in the stamen, tendrils and flower centres) and sewed through both the top and the batting, the cushion top and batting are satisfactorily sandwiched together, so from a construction point of view, there is no need to add additional quilting. 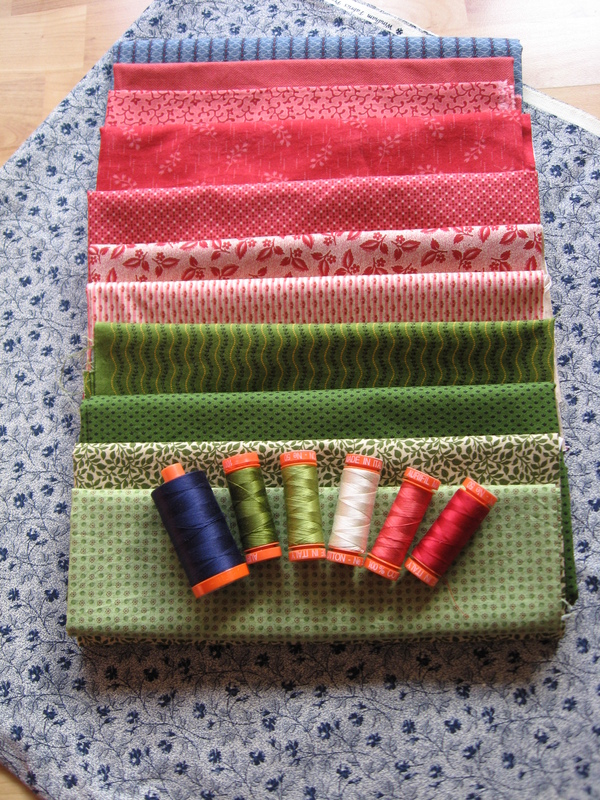 Quilting in this case would be for decorative purposes only, and I don’t think I will add any, as the top is already quite full and busy, but I will live with it in situ for a few days to see what I decide. 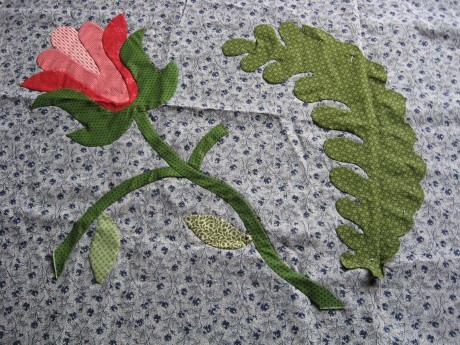 Embroidery acts as quilting and sandwiches the components together. 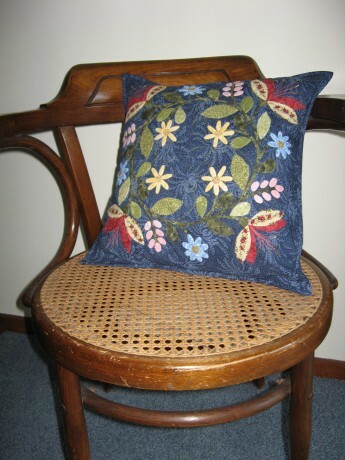 Here is the finished cushion in place on its chair. My new cushion in situ. 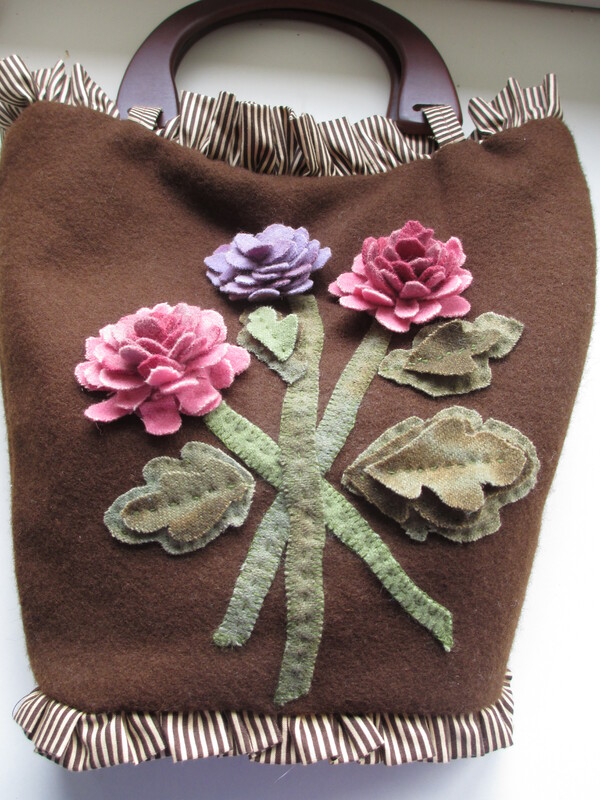 Tuesday Treats: Not all hand stitched gifts have to be quilts. We’ve been busy this week putting the final touches to our stand for the Australian Quilt Market, the wholesale trade event, held in Melbourne on 24 -25 November. This year we thought that we would use a summer theme to decorate our stand so we have been madly stitching display pieces to fit the theme. At the same time as we were making the cushion I happened to read a blog by Ivory Spring about making cushions for gifts when you don’t have time to make an entire quilt . You must pop over to see her cushions in her Virtual trunk show . 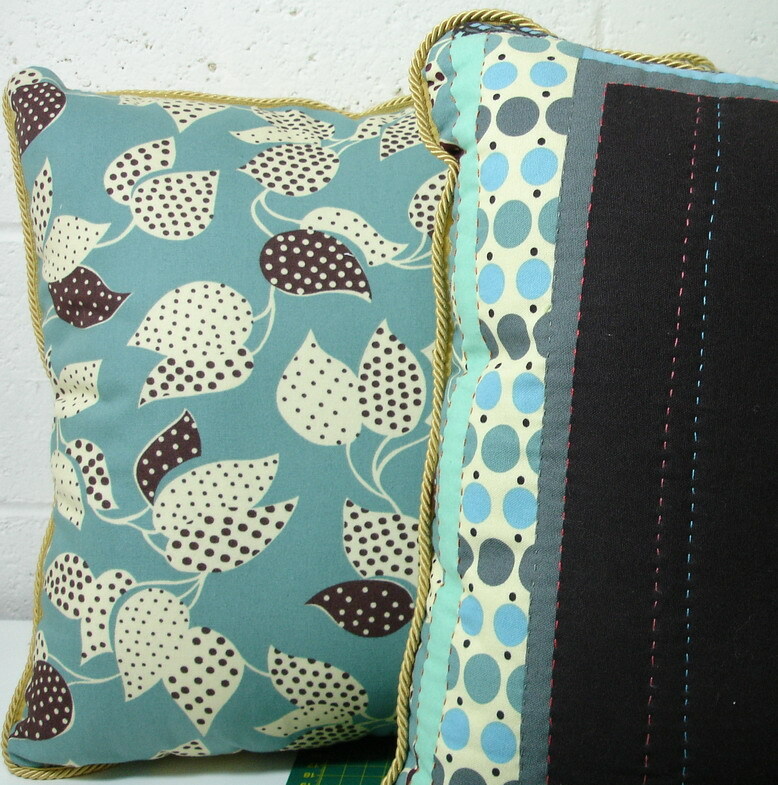 Anyhow, her article set me thinking about how quick and easy it really can be to make a cushion as a gift. 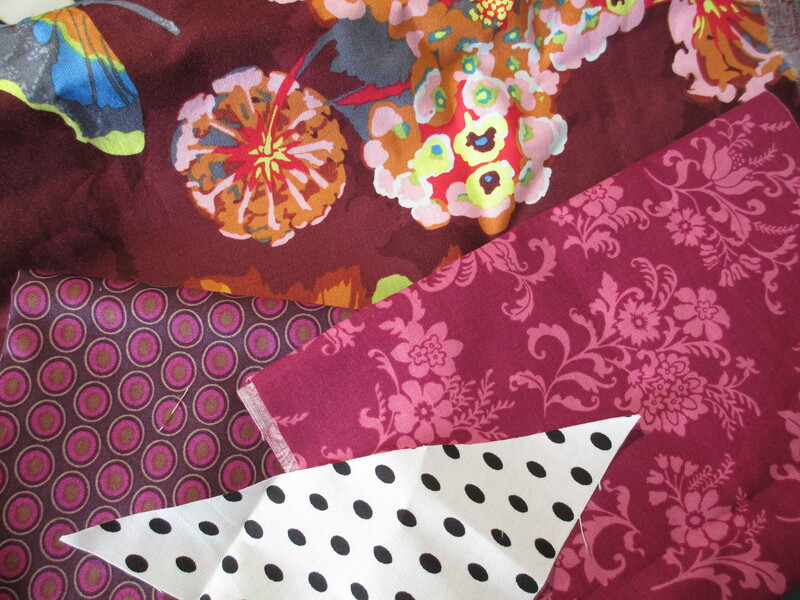 Simply find an appropriate fabric panel, or gorgeous print, and get started! 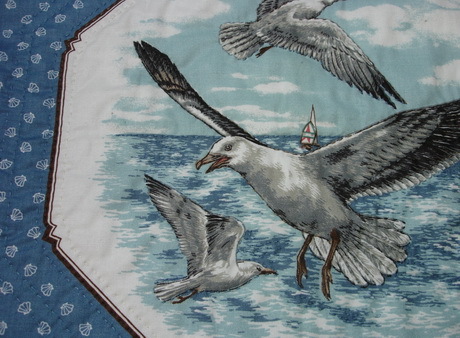 We hand quilted around the birds, and frame on our panel, using Cotton Mako’ 12 to create some texture (well Ladybirdee did), however you don’t even need to do this if you are in real hurry. 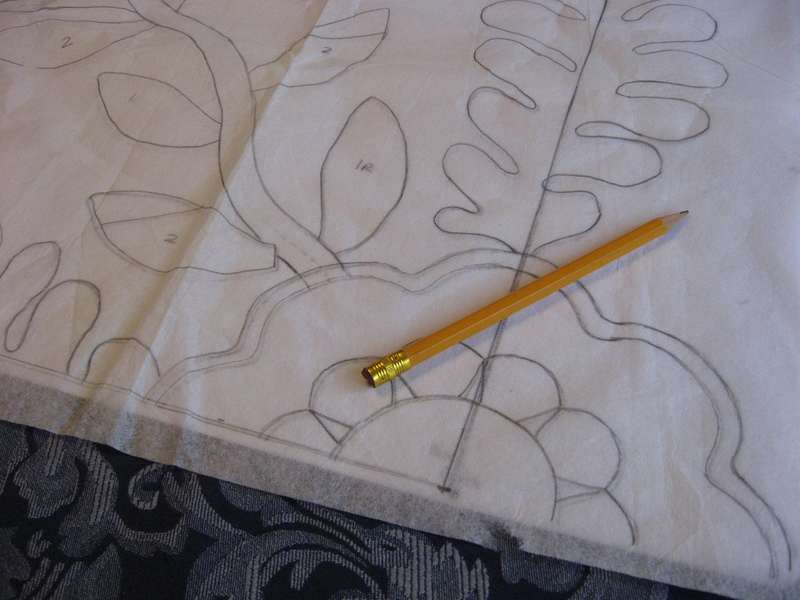 Then I used the “pillowcase/envelop” method to add a back to the panel to make the cushion cover. 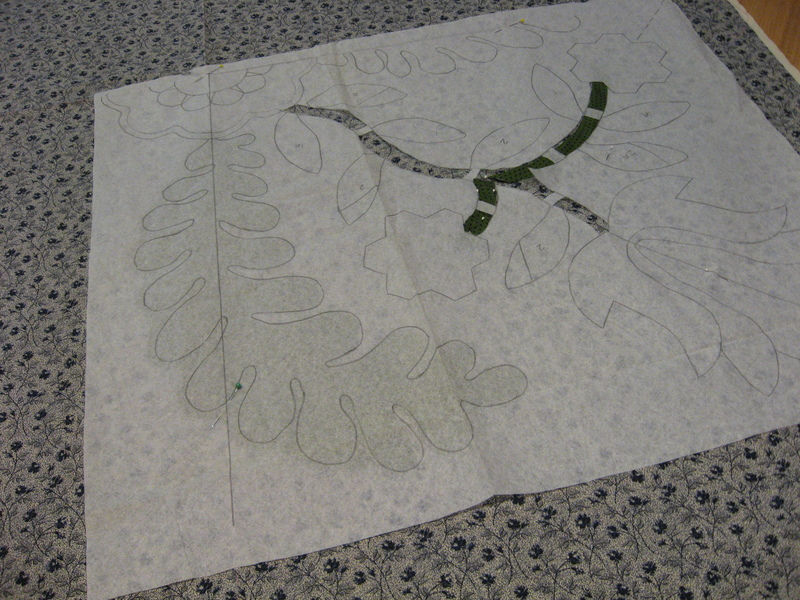 I call this overlapped closure a “pillowcase/envelop” method. 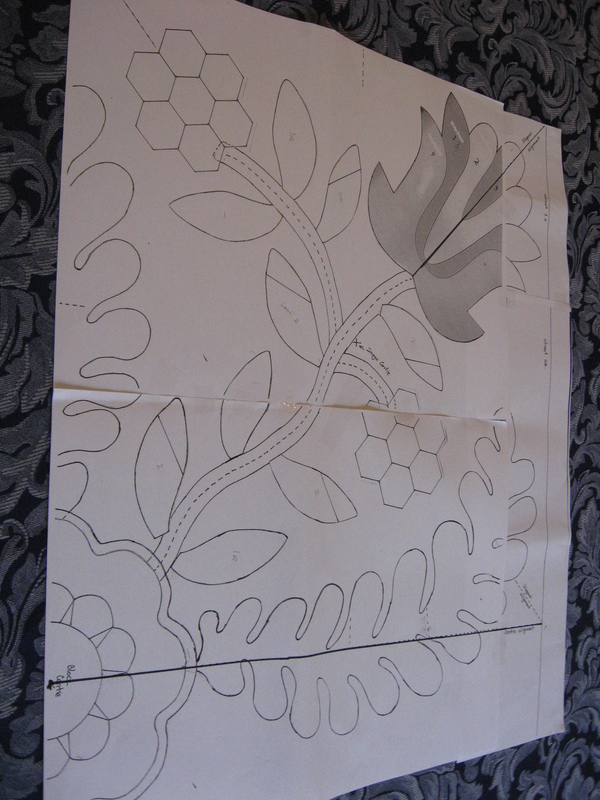 To make the cushion back I used two pieces of fabric, each approximately 2/3rds the height of the front panel. 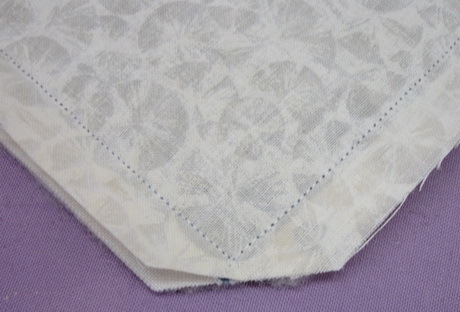 A deep hem, 2.5 cm (1″) creates a firm closure on the back of the cushion cover. I like to overlap the two back pieces by approximately 10cm (4″) so that the opening stays closed, even if a “fat” cushion insert is used. Pressing the seam open will give a neat edge once the cover is turned right side out. 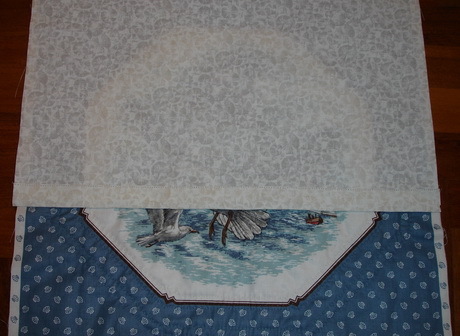 Fill the cushion cover with an insert & you are done! All that is left to do is to pop the cushion insert into the cover and you have gift ready to give to a favourite person. or add nice buttons over the hem, or simply use some velcro inside the opening. 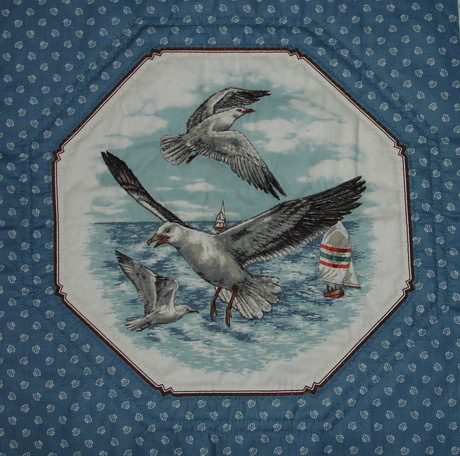 But it is not really necessary, a beautiful fabric, or appropriate panel, and a simple finish will make a quick cushion cover when a gift is need in a hurry. Ivory Springs Virtual trunk show gave me the idea for this post. 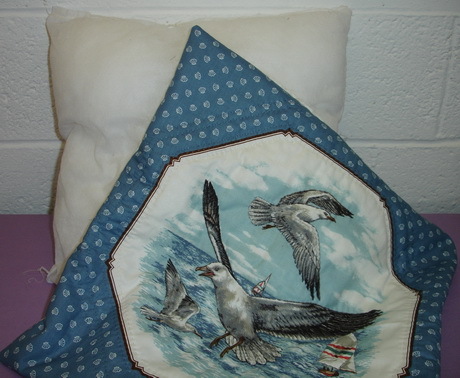 More interesting ways to incorporate embroideries and fabric panels into cushions. Or if you can’t resist Cathedral Windows, make a pin cushion. 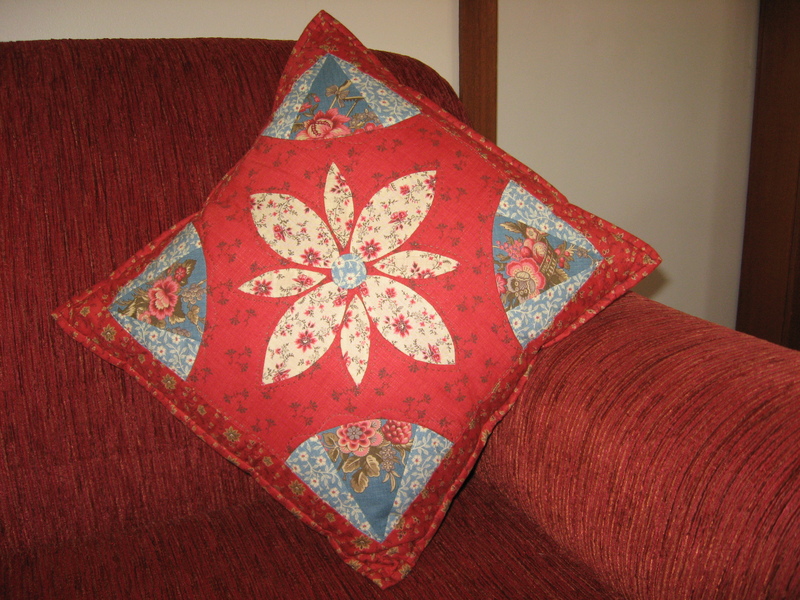 Not an instant gift, but you could plan ahead to make a beautiful cushion like the one Knitsnquilts made earlier this year. 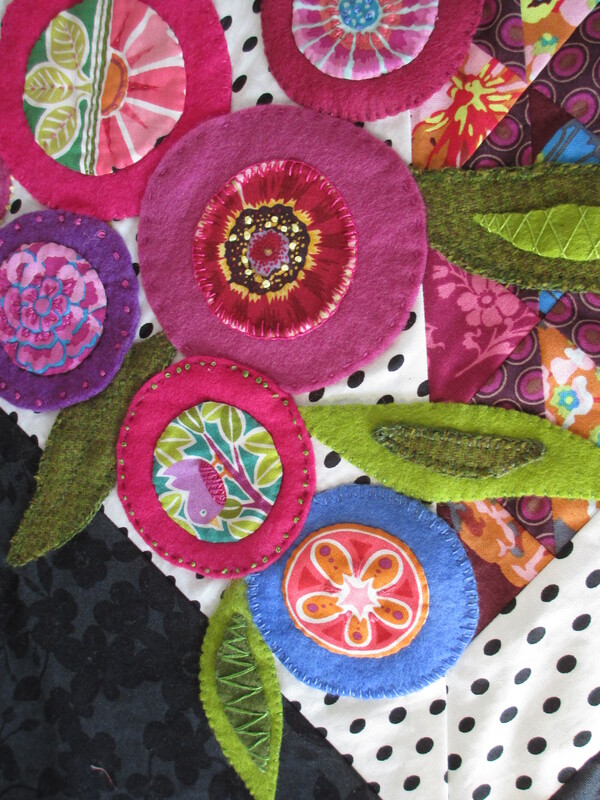 PS: Don’t forget to call back on the weekend to read more about the Australian Quilt Market. Some time ago I purchased a cushion pattern designed by Carol Roberts www cherrypiedesigns.com My intention was to make a pair of cushions for our “naked” family room sofa. When we went on holiday in January, I decided this would be a suitable hand project to take with me. 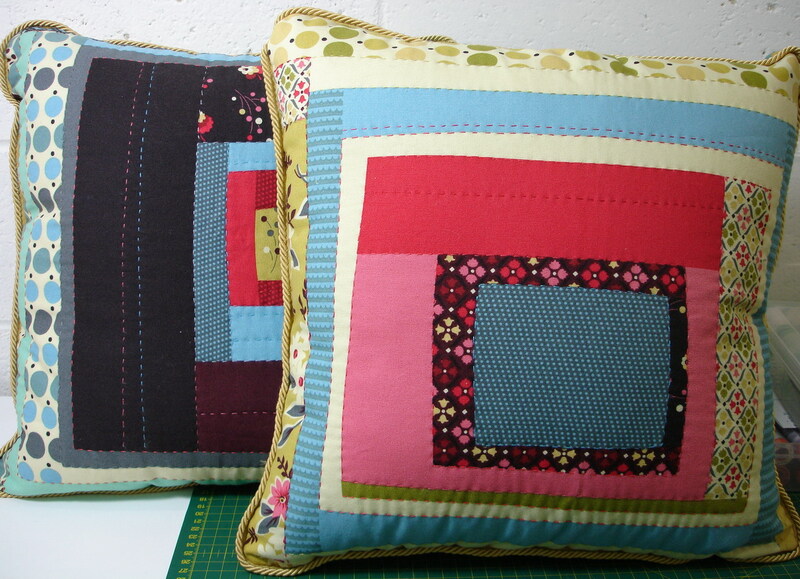 The cushions have some applique which I did using the needle- turn method and some English paper piecing. 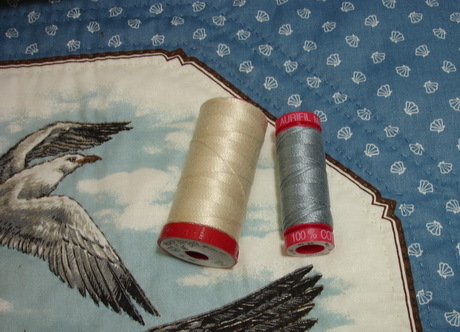 I used Aurifil Ne 50 thread which is lovely and fine and enables neat stitching. 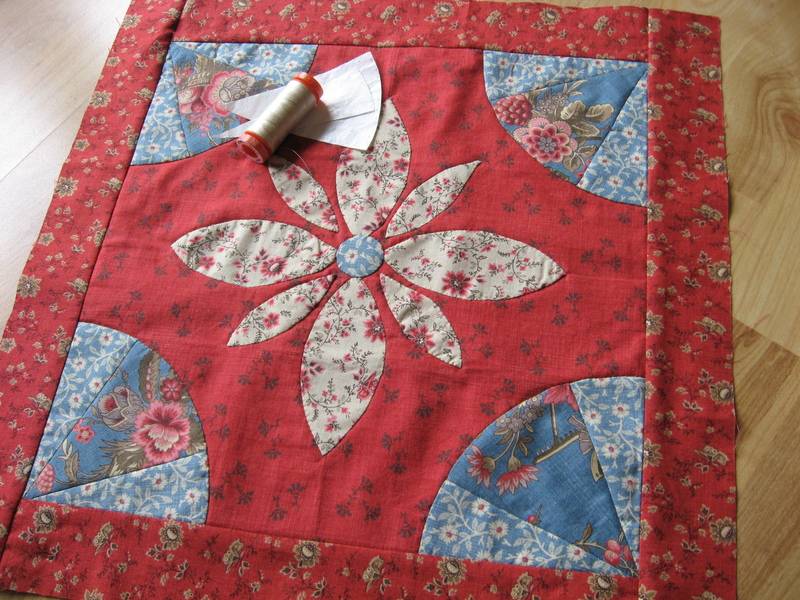 I then used Aurifil Ne 12 thread in a contrasting colour to lightly quilt the tops. This added definition to the design without overwhelming it. 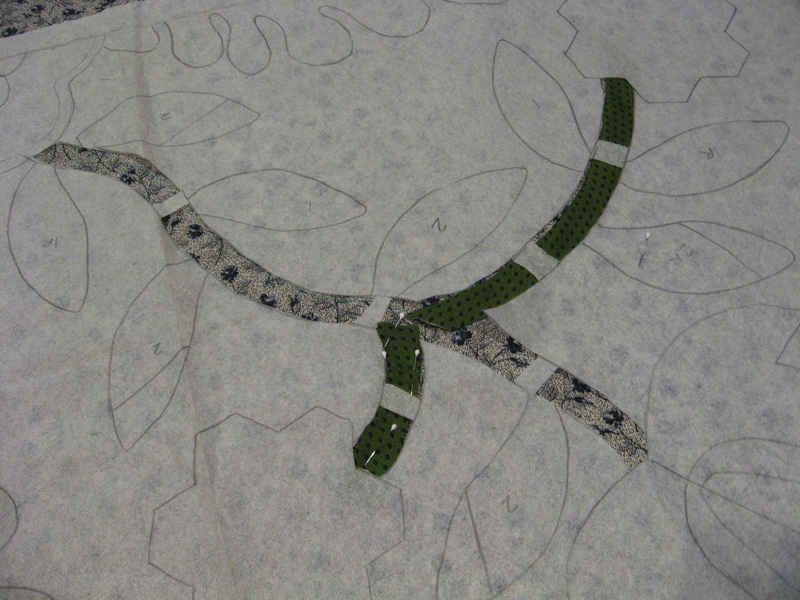 Once the tops were completed, I joined them to the cushion backs by machine. 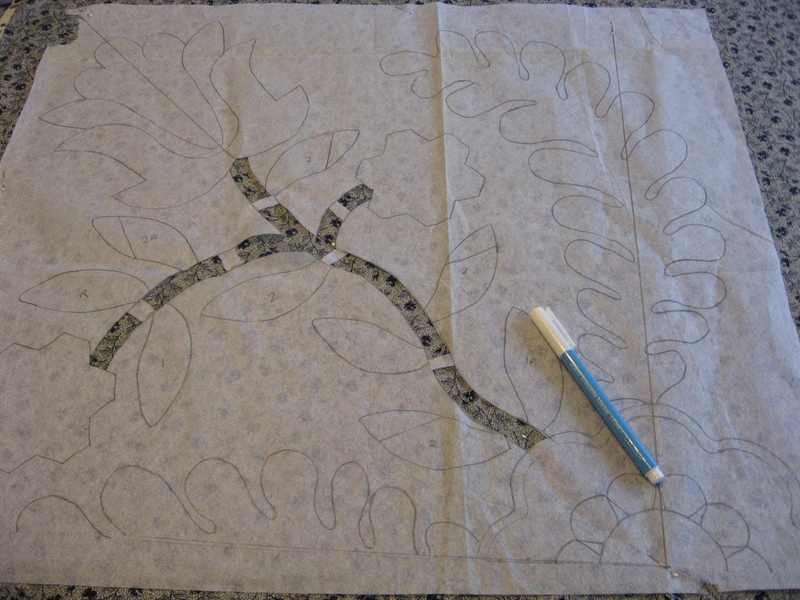 The pattern suggested using binding to do this, in the same way you bind the front and back of a quilt. 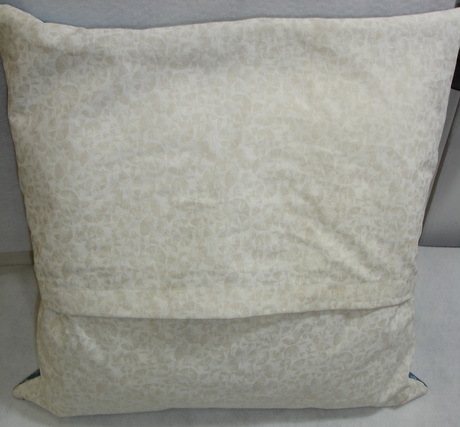 I had not used this method on a cushion before, but was very pleased with the neat appearance this created. Now my sofa is “dressed”……..but my husband wants to know what I intend to do about the naked armchairs! !